Microbiotica said today it will use its precision metagenomics microbiome platform in an up-to-$534 million-plus multi-year partnership with Genentech, a member of the Roche Group, to discover, develop and commercialize microbiome-based biomarkers and therapies for inflammatory bowel disease (IBD). 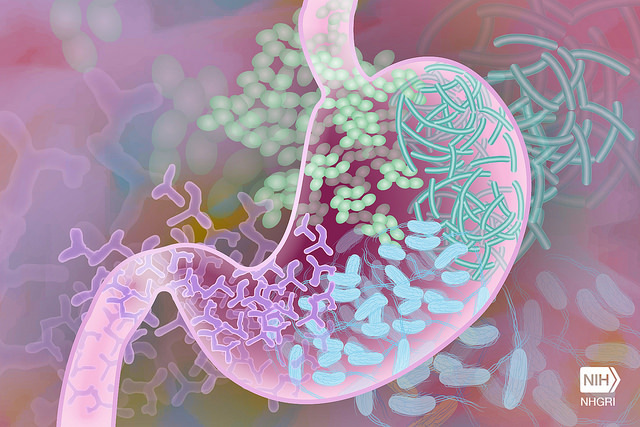 Microbiotica, a Wellcome Trust Sanger Institute spinout, said the platform allows it to culture, characterize, and phenotype the majority of a patient’s gut bacteria, enabling precise association of bacteria to function for the first time. The company reasons that it can surmount what it terms a key barrier to discovering microbiome-based medicines and biomarkers—the inability to precisely identify a patient’s bacteria and then to undertake functional studies in order to understand the biology. The platform—based on tools developed at Wellcome Trust Sanger Institute—includes what according to Microbiotica is the leading microbiota culture collection and reference genome database designed to provide resources for precise metagenomic analysis and functional studies, and humanized in vitro and in vivo models of disease. The physical culture collection aims to enable biological evaluation of bacteria in proprietary translational models, including humanized microbiome mouse models, while the database is growing “at a very rapid rate” through its industrial culturing and sequencing pipeline, intended to provide clinical trial samples for strain-level identification of bacteria, Microbiotica said. The resulting data from such studies is analyzed using artificial intelligence (AI) in order to discern microbiome signatures linked to phenotype, Microbiotica added. In the collaboration with Genentech, Microbiotica said, the platform will enable analysis of patient samples from clinical trials of Genentech’s IBD treatment candidates, with the goal of identifying microbiome biomarker signatures of drug response, novel IBD drug targets and live bacterial therapeutic products. IBD seeks to develop medicines and biomarkers based on microbiota in IBD and two other areas of therapeutic focus, immuno-oncology and Clostridium difficile. For Genentech, the partnership with Microbiotica is its second microbiome-related collaboration announced in as many months. On May 9, Genentech launched an up-to-$969 million-plus partnership with Lodo Therapeutics to develop new microbiome-biosynthetic gene therapies that will apply Lodo’s metagenomics-based natural products drug discovery platform. Genentech and Lodo aim to genetically engineering bacteria in order to produce molecules that have the potential to treat certain disorders by altering human metabolism. The companies did not specify their targets or disease areas of interest—though according to its website, Lodo focuses on fighting drug-resistant microbial infections and cancers. In the latest collaboration, Genentech has agreed to pay Microbiotica an undisclosed upfront payment and up to $534 million tied to achieving research, development and commercialization milestones. Genentech has also agreed to pay Microbiotica royalties on sales of products resulting from the collaboration. In return, Genentech holds an option to license assets that Microbiotica develops as a result of the research collaboration. Genentech’s pipeline includes one disclosed Phase III IBD candidate, etrolizumab, (rhuMAb Beta7, also called RG7413), a humanized Immunoglobulin G subclass 1 monoclonal antibody targeting the beta 7 integrin subunit. In October 2017, Genentech parent Roche trumpeted positive data from two ongoing phase III trials, BERGAMOT (NCT02394028) and HICKORY (NCT02100696), indicating that patients treated with etrolizumab showed improvement in both patient reported symptoms and endoscopic assessment of inflammation. Roche plans to file for regulatory approvals for etrolizumab in 2021. Two months later, Roche launched a partnership of undisclosed value with Boehringer Ingelheim to advance novel treatments for Crohn’s disease and Ulcerative colitis by discovering and developing orally available novel Locked Nucleic Acid (LNA) oligonucleotides. Boehringer Ingelheim said the companies agreed to share clinical development costs and responsibility for the commercialization of potential products.